At least 31 people in the United States have gotten sick from eating raw alfalfa sprouts, or mixtures of raw sprouts that contain them, according to the US Food and Drug Administration (FDA). The FDA recommends that consumers avoid the sprouts for the time being due to potential contamination with salmonella bacteria. TUESDAY, April 28, 2009 (Health.com) — At least 31 people in the United States have gotten sick from eating raw alfalfa sprouts, or mixtures of raw sprouts that contain them, according to the Food and Drug Administration and the Centers for Disease Control and Prevention. The FDA recommends that consumers avoid the sprouts for the time being due to potential contamination with salmonella bacteria. 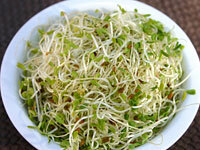 Other types of raw sprouts appear to be safe, the federal agency says. Six states have reported sprout-related food poisonings, including Michigan, Minnesota, Pennsylvania, South Dakota, Utah, and West Virginia. Some people became ill after eating raw alfalfa sprouts in restaurants, while others became sick after eating raw sprouts purchased in grocery stores. The cases started in March and are still being reported. Symptoms of salmonella infection can include fever, diarrhea or bloody diarrhea, nausea, and vomiting. "Initial investigation results trace the contaminated raw alfalfa sprouts to multiple sprout growers in multiple states," according to an FDA statement. This suggests that the alfalfa seeds themselves may be contaminated prior to sprouting. A similar contamination caused several sprout-related food poisoning outbreaks in the 1990s. Since 1999, the FDA has recommended that growers disinfect seeds prior to sprouting and test for bacterial contamination in the water used to grow the seeds. Those with weakened immune systems, including children and the elderly, should avoid eating raw sprouts at any time, due to the potential risk of bacterial contamination, according to the FDA.